In response to North American continent-wide declines in populations of aerial insectivorous songbirds, especially swallows, Environment Canada established a research program in 2009 to investigate the potential causes. Dr. Keith Hobson’s component of this research is to use state-of-the-art light-level geolocators and stable isotope measurements of feathers from barn swallows to establish patterns of migratory connectivity between breeding grounds and wintering grounds. The ultimate goal is to identify key factors contributing to declines in barn swallow populations which have been declining precipitously in their northern range. Their work investigates the potential role of threats on the wintering vs. breeding grounds of barn swallows by establishing where specific breeding populations may winter. Once migratory connectivity is fully established, long-term survivorship data can be analyzed with respect to key variables such as climate variability and local weather conditions to determine the key drivers of population trends. Retrieve geolocators deployed in 2013 to assist with ongoing monitoring of the breeding population and to collect feathers from all handled birds for stable isotope analysis. Deploy another set of 20 geolocators from Woodland Park Zoo for retrieval in 2015. Barn swallows (Hirundo rustica) are small birds (about the size of a sparrow) with purple-blue backs and cream to tawny feathers below. They have long, deeply forked tails, setting them apart from all other North American swallows. Those long, forked tails allow them to fly low, executing quick, tight turns and dives in pursuit of flying insects, typically a few inches above the ground, feeding in meadows, fields, farmyards, and over water. During breeding season you’ll often see them coming to the ground to gather mud and grass for nesting materials. Those mud nests are most frequently seen under the eaves of barns, stables, on structures near play fields, under bridges and inside of sheds. The majority of the Barn swallow’s diet is made up of flies, with the addition of beetles, bees, wasps, ants, butterflies, moths and any other flying insect. They prefer to take larger, single insects rather than feeding on swarms of small prey. In addition, they will frequently pick up small pebbles or crushed eggshells left out by humans, which may be used to help the digestion of insects or to add calcium to the diet. Early research seems to indicate there are potential differences in the Seattle population of Barn swallows compared to populations found elsewhere on the continent. Dr. Keith Hobson and Dr. Steve Van Wilgenberg believe that the Seattle birds will be impacted most by weather events occurring throughout their travels to and from northeastern South America and in the Caribbean basin. 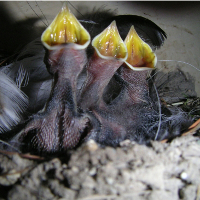 Woodland Park Zoo keepers began banding barn swallows nesting on grounds in the spring of 1999. Keepers and volunteers in all areas of the zoo where the swallows nest participate in the project by informing raptor keeper Gretchen Albrecht of the birds return each year. Four years ago Dr. Keith Hobson and one of his students discovered that WPZ had been monitoring, banding and keeping information on the birds for years. The opportunity to work with the swallows returning to the zoo each year, and to access the historic data, means the project now has information from a site west of the Rockies. 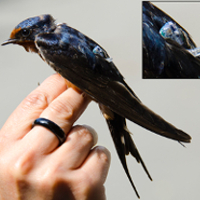 Breeding adult swallows have been mistnetted at the zoo, quickly fitted with a geolocator, and feather samples taken prior to release. Migratory connectivity data collected from the geolocators contributes to understanding how climate and local weather factors are influencing survivorship in the species.